The (Lent) Madness continues with another surreal pairing — this time between an influential 16th-century church musician and a 20th-century Ugandan archbishop and martyr. This match-up even has the holy odds-makers in Vegas shaking their collective heads. Yesterday, Luke outpaced Absalom Jones by a wide margin, 61% to 39% with over 4,500 votes cast, though many commented on Jones’ inspirational story in bidding him farewell. For some commentary on why these pairings are often so difficult, make sure to watch the most recent version of Monday Madness with Tim and Scott. This, along with many other mysteries such as where Scott likes to stay when in Silver Spring, Maryland, and how he copes without his trusty Lent Madness 2013 mug, will be revealed. In other news, we passed the 4,000 “like” mark on our Facebook page. Don’t forget to like us if you haven’t yet done so and encourage your friends to go and do likewise. There’s no finder’s fee for getting people to join in the Madness; you’ll just have to be content with the knowledge that your reward will be in heaven. Finally, stay tuned for a major announcement on the whereabouts of Tim’s missing Lent Madness mug sometime soon. Thomas Tallis is considered the father of English Church music. Little is known about his personal life. We don’t know when he was born, we don’t know if he did or didn’t sing with the Chapel Royal of St. James boys’ choir, we have no idea what he really looked like, and we don’t know how really how to spell his last name – the one copy of his signature we have shows Tallys. What we do know is he forever changed church music with his compositions. His legacy sings to us in music glorifying God, expressing hope and lament, joy and veneration. He composed elegantly simple tunes that welcome the gracious light of dusk in Tallis’ Canon and intricately complex motets, like Spem in Alium, a 40-part motet expressing humanity’s eternal hope in God. He and his contemporaries Merbecke and Byrd, lived and composed in a time of significant political and religious upheaval. The Tudor throne of England shifted British religion from Roman Catholic to English Protestant back to Roman Catholic and finally to Anglicanism. Throughout these massive shifts, all composed the music which allowed the words of the prayers to sing. Tallis’ talent and political maneuvering brought him to the personal choir for the British monarchy. During his adult life, Tallis taught, composed, and performed for Henry VIII, Edward VI, Mary, and Elizabeth I and their courts and managed not to get himself executed. Few musicians past or present have the ability to compose and perform in the style that suited the ever-changing tastes of religious folks, but Tallis did. Tallis and Byrd eventually became business partners and held the Crown Patent for the printing of music and lined music paper for 21 years, as well as a monopoly on polyphonic music, one of the first arrangements of this type in England. If composers of the day wanted to print music or get paper to write down compositions in Tudor England, they had to pay Tallis. While this sounds like Tallis and Byrd were the Cosa Nostra of the Tudor British Music world, they didn’t own a printing press. Thus, they didn’t make much money from their arrangement. Tallis, like many saints, was creative, passionate, and not so awesome in business. He died at home in Greenwich in November 1585 and was buried in the chancel of St. Alfege Church. His remains were likely discarded in the early 18th century by laborers rebuilding the church. His music, however, is with us, sung almost every week in prayer and praise to God. O God most glorious, whose praises are sung night and day by your saints and angels in heaven: We give you thanks for William Byrd, John Merbecke, and Thomas Tallis, whose music has enriched the praise that your Church offers you here on earth. Grant, we pray, to all who are touched by the power of music such glimpses of eternity that we may be made ready to join your saints in heaven and behold your glory unveiled for evermore; through Jesus Christ our Lord, who lives and reigns with you and the Holy Spirit, one God, for ever and ever. Amen. “He was a tall and very taciturn man. And if it had not been for the twinkle in his eye, you would have thought him perhaps even mean. But he was a kindly, large, and very strong man. One morning he was awakened early in his house by soldiers, who accused him of storing arms – which they never found – the purpose of which was to overthrow General Amin’s government. “He was taken to a large amphitheatre in the middle of Kampala, where Amin had assembled his private guard, and where he was jeered. He was then taken by automobile to Luzira Prison, some five miles outside the city. And there he was tortured, and he was asked to confess his crime. His only response was to pray, ‘Our Father, who art in heaven, hallowed be thy Name, thy kingdom come, thy will be done…’ He prayed this prayer constantly for some time under the leader. And finally, in a rage, Amin pulled out a pistol and shot him twice – once in the head and once in the chest. That is the story of Janani Luwum as it was told to me. It reminds me that in every time and place there are people like him – people empowered by the Holy Spirit – who would be willing to speak on our behalf if we were in need and could not speak for ourselves. O God, whose Son the Good Shepherd laid down his life for the sheep: We give you thanks for your faithful shepherd Janani Luwum, who after his Savior’s example, gave up his life for the people of Uganda. Grant us to be so inspired by his witness that we make no peace with oppression, but live as those who are sealed with the cross of Christ, who died and rose again, and now lives and reigns with you and the Holy Spirit, one God, for ever and ever. Amen. 139 Comments to "Thomas Tallis vs. Janani Luwuum"
What a match-up – Musician who forever changed the sound of our prayer and song and a Martyr who lived and died his faith. Vote! Indeed! I voted for Tallis. The only catch is that Tallis and Byrd remained Roman Catholic throught–a real feat in that time and testimony to a certain religious tolerance, at least on the part of Elizabeth I. However, Tallis, along with his fellows Merbecke and Byrd changed the tones of English sacred music forever, and, though it was a very hard choice, it as for Tallis that I had to cast my vote. I love polyphony. But it’s gotta be the Archbishop. I had never heard of the Archbishop until today. (Never heard of Tallis till the play-in round). What an incredible story. Why is there not a movie about this guy? Hello! Hollywood! Get with it! Yes. His is such a powerful witness. I remember Idi Amin, and I also remember how many people did not stand up to him. I doubt I would have been able to do it. The Archbishop was amazing. Having been nurtured for many year by James Kiefer’s biographical sketches from the Mission St. Clare Daily Office, I was familiar with Archbishop Luwum’s story. Even more amazing is the aftermath – the thousands who turned out for his burial, the tens of thousands who came the next year to commemorate the centennial of the first preaching of the Gospel in their country, returning to Christianity because of the witness of Luwum. His martyrdom helped to set the captives free. I place my vote with Janani Luwuum as I ask myself: Could I in our modern world pray “The Lord’s Prayer” with comparable faith and conviction. I love Tallis’ music, and was in fact, all set to vote for him without reading Archbishop Luwuum’s story too closely. But I decided to read, as I didn’t know much about him. Even as I listened to a recording of Spem in Alium, which I hope Tallis and company sing to Luwuum upon his entrance into Paradise, the Archbishop’s story worked on me. 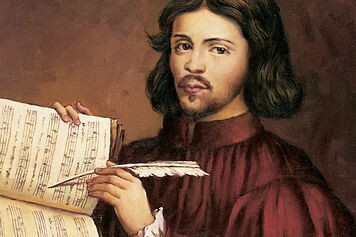 Tallis’ music is such an inspiration to me, but I could never aspire to be a musician of his caliber. Could I, if called upon, give up my life for faith in Jesus Christ? I don’t know, but I hope that I could follow the Archbishop’s example. My vote goes to Luwuum, which was a surprise to me. I too voted for Archbishop Luwuum — what faith! But it was a hard choice, given my gratitude for Thomas Tallis. I also fervently hope that, unlike some current clergy, Archbishop Luwuum was not virulently anti-gay. Your thoughts exactly mirror my own. I love music, including Tallis, but Janani Luwuum? Wow! His is a truly inspiring story of trust in God. I had never heard of him until Lent Madness. We live amidst a truly great cloud of witnesses. I look forward to meeting them all one day. Gotta vote for the archbishop! As a singer, Thomas Tallis has fed my soul many times…but I am truly inspired by the story of Janani Luwuum. Oh that my faith would be that strong. But Thomas still gets my vote. If you’ve ever been lucky enough to sing his Spem in Alium, you’ll understand why. Tallis is in my heart…his music moves me so. But anyone who stood up to the Ugandan dictator and was executed personally by the mad Idi Amin while reciting the Lord’s Prayer will get my vote today. I need to be a celebrity blogger for more martyrs next year. All of my saints this round died sans lions and gunshots, but did manage to leave a life legacy that impacts the Church to this very day in very real ways in the music they composed, the creeds they helped form, the poetry they wrote, and the faith they helped mold. So give Tallis some love! Thank you, Laurie, for expressing just what I have been feeling, but not yet put into words. While I have great admiration for the martyrs, it is the gifted musicians, writers, storytellers and theologians who have given form to this Church I love and so I now reward them –in a small way — by my votes. Fair point. Courage in the face of evil to the point of self-sacrifice is admirable. So is the skill to navigate tricksy religio-political waters and work to keep the message alive in creative and beautiful ways. Need both witnesses. Led a class on janani lawum in my Tucson parish a few weeks ago. Christ church,Istanbul, has him in the .iconostasis. All praise to thee,my lord this night, for all the blessings of the light. Keep him o keep him ,king of kings, beneath thine own eternal wings. I love Tallis – the canon was one thing that strongly attracted me and made me aware how beautiful worship could be when I first came to the church – but Janani Luwuum definitely has my vote today. How great a cloud of witnesses, indeed! As a Lutheran who fancies himself an ecumenical, I had to go with Tallis. To be able to jump about, as he did, with great success gives hope to a person with roots in a denomination that seems to have issues in group prayer with a community in suffering. Although the Archbishop was a great and holy man, being a musician myself I had to vote for Tallis. I am torn, as a long-time public servant working for elected officials, by this match-up. I have fortunately never fallen on my sword like the Archbishop and surely admire his witness against evil, but am ultimately swayed as a choirster by Tallis’ gifts in helping us all glorify God to this day and sometimes walk a fine line in our respective professions. I voted for Archbiship Janani because I want to learn more about his life and witness. I love Tallis’s music and can’t imagine worshiping without it. After reading about the faithfulness, steadfastness, and courage of Janini Kuwuum, I vote for Janini Kuwuum. Thank you Lent Madness for introduing me to this man. I have known Christians whose faith is as strong and incredible as Archbishop Luwum’s. I met them in Sudan when I served there. I always prayed that if the day ever came, I would be half as brave, half as faithful as them. So of course I voted for him. But watch what will happen in the Saintly Sixteen if, as I expect, the Archbishop triumphs today: he will be up against Jonathan Daniels. Martyr vs. martyr. Not an easy choice – except to emulate them in their faith. We speculate about martyrdom by death via lion maceration but there is only mad, insane brutality when an Idi Amin takes a gun and shoots point-blank at a man praying to his God. May he rest in peace and God have mercy on the soul of Archbishop Luwuum. And, may God also have mercy on the soul of Idi Amin. Thomas Tallis has long been important to my own sense of worship and being in the presence of God in community. But when I was in seminary, one of my classmates was a priest from Uganda, sent there by Archbishop Luwum to be safe from the fearsome dictator. We were all greatly saddened when the archbishop was murdered but grateful that John was safely with us, able to return after graduation to continue the archbishop’s healing work among his suffering people. So Luwum is firmly fixed in my personal calendar of saints. My music degree is voting for Tallis, but my heart is voting for Luwum. Yes, I was sure Thomas Tallis was getting my vote, I had not heard the archbishop’s story. I will continue to sing, and with gratitude for the assistance that musicians of past times give me, but my vote goes elsewhere today. What a difficult choice. 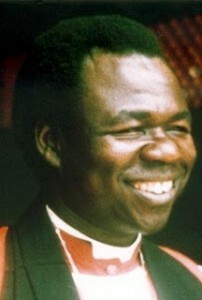 I heard Luwum preach in 1975, and was moved by his presence and preaching. I appreciate Tallis’ music, which I have also heard. All that I had to choose between them was that I actually saw Archbishop Luwum in the flesh, and remember well the shock of his martyrdom two years later. Luwum received my vote and I hummed Tallis as I did so. I voted for Tallis in the play in round. His music is beautiful and brings so many people to God in prayer. But I am in awe of Janani Luwuum. He has my vote today. I hadn’t heard of him before. Glad to know his story. The contributions of church musicians are wonderful and do so much to make the liturgy transformative. But Archbishop Luwum stood for justice against oppression, a model we should all follow. And the collect sealed the deal for me. For those who are curious, the preacher whom I quoted was the Very Rev. Philip W. Turner III. At the time he was the Dean of Berkeley Divinity School at Yale in New Haven, Connecticut. His ordained ministry began as a missionary from 1961 to 1971 in Uganda, where he came to know Janani Luwum. Thank you, Fr. Neil! I was curious to know the “rest of the story”. I also planned to vote for “music” until I read the amazing story that happend in our own time and with such little fanfare….I am thankful to know his story now and give thanks for his amazing witness and faith. May we all take joy in his willingness to live for God’s glory…. Gotta stand with our contemporary Saints and Martyrs. Would you forgive voting ‘irregularities’ today and allow one each??? Two more interesting dudes, both teaching us ways to glorify God, one through art, the other through prayer, one dedicating a lifetime, the other a sacrifice in the act of prayer. Recent history in Uganda continues to be a lesson to the world, and to Anglicans, that justice and mercy is still what it boils down to. Thanks be to God for Tallis, but my heart (and vote) belongs to Janani. I too thought I’d be voting for Tallis, since his music is both foundational and transformative, and even though I’ve known and taught Janani Luwum’s story for many years. But today I must honor the martyr even while I hum the Tallis canon. Driving home just now, an NPR news story about militants in an African country outlawing music had me ready to give my vote to Tallis, for the importance of music in our lives, but Luwum giving his life in a manner reminding me of what the early Christians experienced, I had to put my vote down for him. I, like others this morning, love Tallis’ music while I am deeply touched by Archbishop Luwuum’s message to contemporary Christians. I will continue to listen to Tallis even as I ponder and act upon how I and others should authentically live into our Lord’s Prayer and confront evil in our own places. Idi Amin, you jerk. Is there a place we can vote to have him expunged from human record? #notverychristian #meaningme I’m voting for Bishop Luwuum for his immense courage and faith. Tallis, like the Vicar of Bray, lived through terrifying times. The Archbishop spoke truth to power. We need both. Since I know a priest who served with Luwum, I voted for him. I’m just being perverse. I have voted for Thomas, but I’m sure Archbishop Luwuum will win. Thus my vote. There will be many martyrs before the throne of grace, but among the praises they sing will be the music of Thomas Tallis. I am old enough to remember Luwuum’s death and Idi Amin. Both of these men gave greatly to not only the church, but all humanity. I find my spiritual center when I listen to Tallis, but this day, though, my vote goes to Luwuum for what he did to bring Christ’s sovereign reign to earth. Oh, this is tough!!! I love the music of Thomas Tallis, and that of other composers he inspired. Hearing his compositions inspires me, and helps me feel closer to God. But…can that contend with martyrdom?! Shoot. I love you anyway, Thomas Tallis! Janani Luwum gets my vote, of course. In Tanzania I met many people with this kind of faith and devotion. Some of them are leaders and some are lay people. Bp. Luwum warned against “the powers of darkness” knowing they would kill, but kill only his body. His words and holy example are alive and well in Africa and the rest of the world. He is in (with) Christ now. I have to agree with so many of the previous posts. I almost didn’t read about Luwum. I figured I would have to vote for Tallis because of my musical heritage. What an amazing man the ARchbishop was. This powerful bio you’ve shared with us is truly humbling. I did read and pray for his soul. Wondering of Tallis and Luwum are laughing at us from their perch in heaven? it has to be Thomas Tallis. Also, my father was an organist at the Episcopal Church I still attend. Help, I cast my vote and see only the annoying spinning circle and a loading message. I too struggled with this match-up, loving church music as I do, but I ultimately went with the brave archbishop, Janani Luwum, [if the spinning circle evver allows my vote to be cast]. Could it be that one of my picks (Janani Luwum) might actually advance to the next round? Most of my choices have lost. Boo! But this is still fun! My admiration of Janani Luwum is immense, but I have to vote for the glorious beauty of Tallis today. Suffering is not the only way to witness to our faith. Is it because his death was so dramatic that there is so little information here about Luwum’s life? I guess we can assume he rose to a position of such authority because of wonderful pastoral skills. Had to vote for Janani Luwuum. What a witness! I need a witness every day, reminding me that I am able to face oppression, injustice, hatred with hope and faith. To pray in the face of the dictator! My vote goes to the archbishop! What an inspiring example in our modern times. Now I love me some polyphonic tunes, but my convictions and vote lie with Janani Luwum. #ThxB2God! I’m torn. Part of my heart urges the martyr, but the other yearns for the music. And I have to wonder as a scholar of myth what it is that draws me so strongly to the martyrs and their narratives, especially since my goal is to teach about living for God. Thank you for introducing me to Janani Luwum. This is why I like Lent Madness. Tallis’ music, while the language of God ( thank you Lisa Fry) it was Archbishop Luwum who is a testiment to our faith. Two worthy contenders but only one vote to cast. I had to go with the Archbishop who at this time looks like he is heading to the next round. However like others I am eagerly waiting to find out what happened to Tim’s missing mug? Answers please! Inquiring minds are waiting. At first glance I thought this would be difficult – because I love Tallis’ music, and find Luwum’s story so compelling. But I have to admit that – inasmuch as I think “Spem in alium” is one of the most remarkable feats in the history of music – Tallis is one of those additions in “Holy Women, Holy Men” that give me pause. “Little is known about his personal life,” Laurie wrote. What happened to models of heroic faith? Can we really extrapolate from his extraordinary music anything about the holiness of his life? I’ve known a few composers and musicians in my day (read: lots), and I don’t think so! On the other hand… the Archbishop – no doubts or questions there! Voting done. I surprised myself and just voted for the Archbishop. While I was a priest in the Diocese of Iowa, I had an opportunity to visit our companion diocese of Swaziland and help build a house for one of their priests. Two years after that trip the priest was executed as he walked along the road near his parish. He was killed because he also spoke truth to power. I LOVE Tallis’ music but my heart and soul sings for those with enough courage to witness to God’s love in this way. The musical gifts of Tallis can only be given by God. The faith of Luwum, though, won me over. I question whether or not I’d be able to do the same. I pray that I would be able to live my faith till the end. I guess one does not truly know until they are tested. The spiral of learning on Lent Madness runs deep. Given the beauty of music in my church, I was excited to vote for Tallis. Then I read about Janani Luwuum, bearing witness to our shared faith in the face of ‘dark powers’. Inspiring, and the music of Tallis continues to inspire and nurture our faith, that we may go forth and do likewise, bearing witness to contemporary evil. There are many ways of giving one’s life to God and the church, and I am proud to vote for Tallis, whose music has shaped and inspired generations of faith and worship. I didn’t know anything about the Archbishop until today. I’ve experienced the music of Tallis many times. There is something about the simplicity of the Archbishop’s actions–his choice to rise above the terror and pray a prayer that is so familiar–I think it’s an example I could at least try to follow in extreme circumstances. I vote for him not because of how he died but because of how he lived those final moments. I love Martha and Neil’s comments about the saints laughing with God as we ponder all this. I bet they sing, too. I have much admiration to anyone who can withstand the buffeting winds of change within the Church AND maintain their creativity, but I’m awed by Janani Luwuum’s courage to stand up in the name of Christ for those with no voice against the merciless Idi Amin. My vote goes to the archbishop. I also made a comment on the Facebook page, but y’all have a typo. The Tudor king named Edward was Edward VI and not Edward I. I know my British monarchs starting with the Tudors, so this caught my eye right away. Thanks for pointing out that typo. SEC, get on that to correct!! With that out of the way, thanks for introducing us to the story and sacrifice of Janani Luwum. I love the music of Tallis, so this was a hard choice. At risk of being cast out by the supreme executive committee I would like to protest this match up. It seems to me that putting a musician up against a martyr with a first hand account of his death is entirely unfair if there is no similarly heart tugging link to the music. While I think the good bishop would still win this battle, it would put Tallis in his best light and give him a fighting chance. If “Spem in Alium” is too long, perhaps “If ye love me”? Thank you to all who did the work to put these battles together, and especially the guest bloggers. Have to go with Luwum. I gave a short talk on him at a Province meeting once. In a world where clergy considers themselves persecuted if someone doesn’t like their sermon and we, the laity, feel persecuted if someone snares our parking space; we all need to be reminded of those truly persecuted in this day and age. I like to say I was born in a choir stall and cut my teeth on the 1928 Prayer Book. I learned “Tallis’ Canon” as a child and still love it decades later. I have been in church choirs for more years than I care to admit. I was all set to vote for Tallis (as so many of you were). As so many of you did, I voted for Bishop Luwuum for his sheer strength of devotion to God. And as so many of you have said, the angels and Communion of Saints were singing Tallis as he arrived. Leonard is casting the family vote for Janani Lumwuum because he spoke up for the people who had no voice and because he was brave. What Laurie Atwater said, since she said it so much better than I could have. My ex-wife and I were ready to go to Africa to work with Bishop Luwum after he gave a keynote speech at our diocesan convention in Oregon. We talked with him after the speech, and were very eager to go to Africa. Shorlty after that, he was murdered by the Kenyan government. Maybe a candidate for next year! Postscript–Just finished listening to “Spem in Alium” on YouTube. Oh, my! Dear Verdery, Would you care to share a link to “Spem in Alium” on YouTube? I notice there are quite a few performances posted. Others may be interested in listening. Many Thanks! I was teaching in Uganda during the terrible time of Idi Amin, and as much as I love and appreciate Thomas Tallis, I’m voting for Janani Luwum in honor of all the courageous martyrs and confessors of the period, including some of my students. But what a choice!! Fortunately, I trust, in the resurrection we get to have them all alike as friends and companions. Lent Madness is followed by Easter. I didn’t know anything about Bishop Luwum until reading this post today. I had to vote for him. I think we need to be reminded that not all martyrs for the faith were from centuries ago. We in the U.S. tend to take it for granted that we can practice our Christian faith unhindered and don’t always realize that this is not so in the entire world. Don’t know if I would be able to do what he did, knowing the consequences. Above my desk is card reminding me that we have tickets to the Tallis Scholars on their 40th Anniversary Tour mid-March. “The Rock Stars of Renaissance vocal music”. Each day I welcome the stories of two saints and then the less welcome struggle to choose. Enriching and playful, informative and troubling….as I hear the timeless notes of Tallis , I vote for Bishop Luwum …who speaks for those without voice. I must remember this is fun and not be so disturbed by the impossible daily choices! Archbishop Luwum faced pure evil with the courage and faith few people could match. It is wonderful to have written such glorious music, but it is to represent the faith and courage of people such as the Archbishop that much of this music is written. NOT FAIR! Pairing a modern martyr with a songster (no matter how great). The deck is loaded! in this country anyway, Romero’s murder got a lot more media play than Luwum’s. Why is this? Was it because at the time of Romero’s death the Reagan administration was supportive of the government that killed him? Roman Catholic church has more money to make movies than the Anglican church? Both were gifted in incredible ways, but I’m going with the Bishop, who’s situation hits closer to home (for me). I just shudder to think of what the next choir practice will be like if my Director of Music finds out I didn’t vote for Tallis! She gave our congregation a great presentation on the “top ten” reasons to vote for Thomas, this past weekend. HAD to be Janani Luwuum. His LIFE was the most spectacular music. Friends of Church Music Awake! Thomas Tallis the great visionary and composer of English church music is being crushed in Lent Madness! A Tallis loss will be one more step down the road to Happy-Clappy, 7-11 style psudo-rock smelted by the devil from the drug corrupted souls of aging hippies. If you care at all for the sacradness of worship you will go now and support Thomas Tallis in Lent Madness. Thanks for interjecting some humour into this oh-so-serious discussion. Tallis has fed my soul through his music my whole life and has for many years graced my family’s meals. However, the witness of Janani Luwuum, whose martyrdom I remember, stands as a shining example of the greatest of Christian witness. Besides, I love his smile. He gets my vote. What a witness the Archbishop’s life is for all of us in the Church! However we all know that musicians like Tallis need continual affirmation, so 1 more vote for Tallis!!! I just don’t remember all the choices being so hard last year! Musically I long to go for Tallis, but Luwuum’s story is so compelling. I think I”m still going to go for Tallis, but with great reluctance at leaving Luwuum out. Of course it looks like Tallis won’t win anyhow, so I’ll just be continuing my 100% underdog vote. SEC if I change my mind and keep voting back and forth but the votes cancel out to = 1 vote, is that cheating? Wish could vote for both. But it’s madness, so voted for one. As much as I love Tallis’ music (inc. the hymn “I heard the voice of Jesus say” and the Vaughn Williams Fantasia on the same Tallis theme) and recognize the key role he played in the worship of the Elizabethan Church and beyond, one of the important ancient criteria for sainthood is martyrdom, and courageous Christian witness. Therefore, I am voting for Archbishop Luwuum. Besides, I first read a brief biography of him while I was discerning the renewal of my call to ordination and was very moved and encouraged by his witness. Martyr over musician. What more can you give up for Lent, than life itself? We have enough suffering in this world. Voting today for the beauty that helps make the suffering bearable. Yes, thank you for this wisdom. Not at all comfortable in judging a man killed by a horrible present day dictator. Please bring back the lions, silver platters and lands of make believe. Until then, hum your favorite Tallis hymn. I was so ready to vote for Thomas Tallis because I am a music nut, in the church choir, etc. But the story of Lawuum won me over, too. I love the idea of saints who are representing the incarnation in our own day — it reminds me that we should all embrace the audacity of being faithful and perhaps take more risks in the name of Christ. I am having trouble voting today. The vote place under the biographies is not activated on my screen…either on my I-pad or my MAC. I have pasted the address as directed and keep getting the place where it says to vote, but it does not take me to the voting option. Hope you can help before the voting closes. My husband, jmcneillanderson@comcast.net , also votes from this MAC. Luwuum’s life and testimony struck a chord with me. It reminded me of what Jesus went through, taunted, tortured and killed, yet all the while giving thanks to God. As significant as Tallis’ contribution is to Church Music and a worthy competitior, my vote is with Lawuum. apologies for my atrocious spelling! Tough, tough choice. I love and have sung so much of Tallis’ music (including being the first voice to start Spem in Allium, an amazing experience to sing that opening G note knowing you are about to set loose eight quintets in a piece of music that moves like an ocean wave around a room), but have to go with Luwum. My sister-in-law’s parents were living in Uganda during the Idi Amin era and can tell of the horrors. I am moved by music, but I voted for Luwuum. There is music in all of us; I wonder how many of us have what it takes to be martyred for our faith. see God and brought me around to vote for him. I was a music history major back in the day and wrote papers on Tallis and his contemporaries. I cut my teeth on the music of Tallis in many choirs and choruses. What transporting beauty! While I admire and am certainly thankful for the courage of the Archbishop and pray that I would have what it takes to stand as he did against evil, I need to vote for Thomas Tallis. It seems that he is getting a real trouncing in the voting that is unnecessary. His music is glorious! He deserves better than he is getting. Come on, musicians out there….vote Tallis! What an amazing and dissimilar match up. I have never heard of the Archbishop’s powerful story. Tallis’s music has been a pleasure to learn and hearing it has transported me from a painful hospital bed to peace and memories of what has been and the hope of what is to come. Tallis has meant more to me on a daily, deep and spiritual level and thus has earned my vote. Tommy T all the way! Particularly compelling to my reading of the CB commentary for Abp. Luwum is that his persecution and execution seems like Idi Amin’s horrible parody of Jesus of Nazareth’s public trials and private audience with P. Pilate. However, for T. Tallis, this CB comment caught my attention: “During his adult life, Tallis taught, composed, and performed for Henry VIII, Edward I, Mary, and Elizabeth I and their courts . . . . Few musicians past or present have the ability to compose and perform in the style that suited the ever-changing tastes of religious folks, but Tallis did.” My experience in church music includes mediating the fractious anthems of parish musicians’ vocal preferences for “contemporary” or “traditional” or “blended” worship (often vocalized at the level of forte, if not fortissimo). After considerable deliberation, my vote goes to the saint who faced the peculiar persecution reserved for church musicians, `managed not to get himself executed,’ and whose legacy of harmonious, polyphonic music-as-prayer serves the church even now. To stay Christ-centered during historically divisive and deadly decades, while remaining in the core of royal court life, is astounding. And all the while composing what surely must be God-inspired timeless beauty! Tallis, not only `managed not to get himself executed,’ but lives in music that reflects the Eternity of the Savior’s love. I was saved, yep gonna use that language, at a revival at Grace Church Manhatten in the early 80’s preached by Bishop Festo Kivengere who had escaped Uganda with his family and he shared the story of Archbishop Luwuum. Festo also shared about Arbp. Luwuum praying for an encouraging his captors. This, I thought, is faith in a God I can give my life to, and so I did. Archbishop Luwuum all the way!!!! But I have to say that when my soul is feeling sparky I always put on Von Williams riff on a Theme by Thomas Tallis. As I was trying to say when called upon to actually help several library users, I hadn’t heard of Archbishop Luwuum – his story of courageous faith is very moving. But I so love the music component of services that I must vote for Thomas Tallys. Tallis long-lived influence is powerful and had my vote going in to this round; however, the martyrdom of Bishop Luwuum struck a far more resounding chord in my heart, and, therefore, receives my vote. Thank you to Ms. Brock & Mr. Willard for their fine biographies! The two little choristers in my family cast their unified vote for Tallis. I was all set to cast my vote for Luwuum but i could not, in good conscience make my decision without at least hearing some of Tallis’music. While my wife read the Lusuum bio, i dutifully summoned up a Tallis Pandora station. So as i listened to this music i realized that, despite his over priveled life, the voice of God was speaking through Tallis. I then cast my vote for Tallis. As they say in the news business, “If it bleeds, it leads.” One who dies for the faith must advance in the rounds. I do love Tallis’ music, and my vote does not diminish his contribution. As was mentioned in one of the videos, by voting for one, we are not voting “against” another. All the saints are loved. What has been so difficult for me is choosing between the ancient fathers who gave us our faith and those who have contributed so much to our continuing inspired worship and those who have given their lives to spread and preserve our faith – what to do except to thank all of them and thank God for their witness – and thank Lent Madness for educating us!!! Is it Luwuum or Luwum? Both are posted. Music is an essential element of worship for me — Thomas Tallis! While I voted for Tallis, partly because I love his contribution to Catholic (both Anglican and Roman) worship, and partly because of Madeleine L’Engle’s character, Canon Tallis, I am really pleased to see ABP Luwum well out ahead. His faithfulness even unto death in the face of renewed persecution of Christians in Uganda. Oh yes, the Chapel Royal is not a place — it is the body of clergy and musicians who provide for the spiritual needs of the Sovereign. Since 1702 it usually functions in the chapels at the Court of St. James, and before that at Whitehall, but in Tudor and earlier times it had no set home and simply followed the monarch. Tallis may or may not have been one of the children of the chapel (he certainly was one of its organists for much of his adult life) but would not have served at St. James.